Violent media doesn't lead to mass shootings. Did you know that the Parkland shooter was cutting himself on Instagram and showing off his weapons, and had to be given psychological evaluations by the county? Oh, you don't care? Neither did the FBI when someone close to him called their tip line months ago and told them "he might be a school shooter in the making." They didn't forward that information to the nearest field office or to the Sheriff's Department. Telling the Sheriff's Department might not have helped since they had been called to the guys residence at least 39 times (some of which had to be after he was no longer a minor 17+) and they didn't arrest him or report him which would have caused any felonious or domestic violence behavior to be recorded in the FBI's database so he would not have been able to legally obtain his weapons (which he did by passing the FBI/NCIS background check that everyone who purchases a weapon from a gun store must, which was legislation supported by the NRA!) It is not the NRA or lawful gun owners that are the problems, it's the broken criminal justice and mental health systems that are the problem but pointing those out do not further a political agenda. 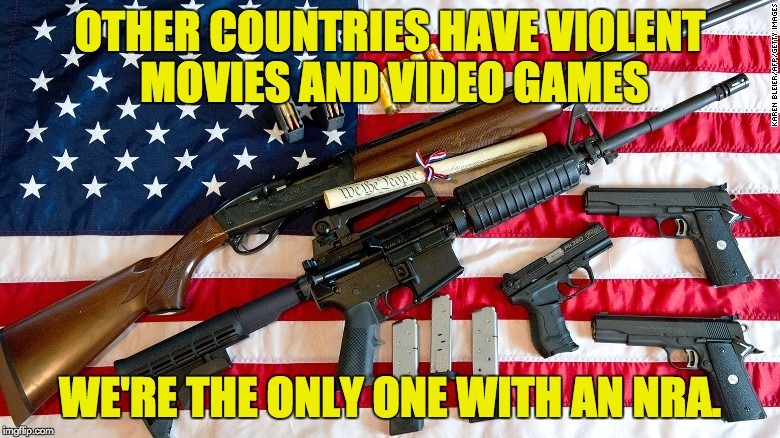 OTHER COUNTRIES HAVE VIOLENT MOVIES AND VIDEO GAMES; WE'RE THE ONLY ONE WITH AN NRA.